I often get questions for various issues with 3D Vision not functioning properly and in most of the cases the issue is caused by having multiple displays connected to a PC. So if your new 3D Vision setup is misbehaving and not functioning the way you expect it to and the way it should normally work, then the first thing you need to think of is if you have a second display connected to the PC. The easiest way to diagnose if the issue is caused by the second display (this goes not only for monitors, but for TV sets or projectors as well) is to simply physically disconnect the extra display from the video card and see if 3D Vision will function properly. Just a reminder, the 3D Vision-Ready monitor needs to be set as primary in order for it to function properly for playing games in stereoscopic 3D mode or viewing 3D movies, so be sure that this requirement is fulfilled as well. Now, if you find out that your additional display is causing the problems with 3D Vision you don’t have to disconnect and reconnect it physically form the video card all the time. You can just disable it through the Nvidia Control Panel when you need to use the stereoscopic 3D mode and after that you can simply re-enable it. Just go through the Setup Multiple Displays menu in the control panel and unckeck the display(s) that don’t support 3D and everything should work just fine. Now, in theory if you’ve set the 3D monitor as primary you should not have trouble even if you have a second display connected to the PC, however in practice this doesn’t always happen. 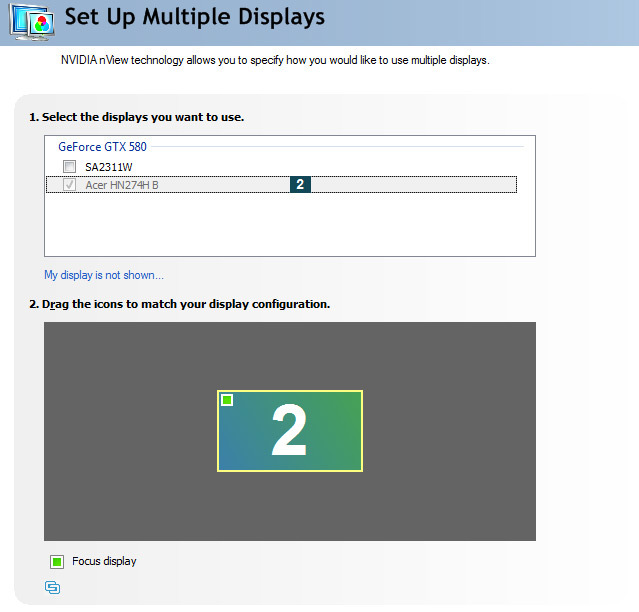 The requirement for the 3D monitor to be the primary display needs to be fixed so either display can be used. I prefer to have a 2D monitor as my primary display. Surely the drive could be fixed to do this. Well this is the only way I get my 3D Vision work :D I have 2 monitors, only one of them is 3D. I have to disable the 2d monitor and leave only 3d monitor from NVidia settings always when I want to do something in 3d. Otherwise you get all kind of weird blinking and behavior. I have the same problem. It is really annoying. I have dual monitors for a reason and like to have reference pages or even some tv show going. It would be really nice if NVidia could release a driver to fix the issue. I don’t see a reason to buy a 2nd 120hz monitor just so that they don’t fight. I use 3d vision through my PC to my 3D projector. If I want to play 3d, I unplug my monitor as I noticed it had trouble connecting with both plugged in. I run two displays and 3D mode worked fine with both enabled until I updated my video drivers to 296.10 a few months ago. It took me a while to figure out why updating to those drivers caused 3D to not work properly in most games, but I discovered that it was the secondary monitor. When I want to play in 3D, I disable the display in the control panel and everything works fine. And what I can do, when I have to run 3D only on secondary monitor(projector) because my Visoft software support 3D output only for secondary monitor? Can anyone help me how to set it up? Or what can I do? What about if I want to connect a 3d monitor and a 3d projector, and switch back and forth depending on the situation? My monitor has a built in emitter btw. I haven’t bought the projector yet but I’m wondering if I’ll have to buy another emitter just for the projector. It would be cool if I could just set both monitors to the same resolution and refresh rate and clone them, therefore being able to view the same 3d image on both screens with the emitter from the monitor.